Tickets onsale soon from Welcome to TicketWeb! Isolated Atoms formed in 2008 in the Black Country, West Midlands. They play serious, mature and intelligent music with an exciting edge. They are being tipped by many to be the hottest undiscovered band in the UK. They have come a long way in a short space of time, having already confirmed a support slot at the London Koko opening for IAMX, and being booked for shows with Ladytron, Haunts and long running German electro band The Notwist. Isolated Atoms do things a bit differently, if you're looking for a traditional rock band, you won't find it here. But if you're looking for original, forward-thinking commercial music, they supply the goods. Their name reflects their music, as it's intense, moody and dark (Isolated) while being energetic and explosive (Atoms). 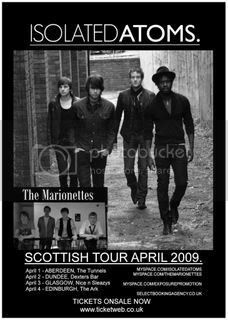 The Isolated Atoms EP was released on iTunes on the 12th of Jan 2009 to coincide with their Feb mini-tour. Their tracks have been used in many compilations, such as a release by Lakeland Records coming in March 2009, a cover CD for iPod user magazine and a CD released by The Coventry Kasbah venue with the best of the bands that have played at their venue. The band will release their next single 'come on down' to coincide with these April shows. The band have also recently caught the eye of Alan McGee and Warner musics Danny Watson, and have been invited to play their legendary Death Disco showcase, following in the footsteps of bands such as Glasvegas and The Killers to name only two. Ill produce you when you're signed' Peter Hook (Joy Division & New Order). 'Isolated Atoms clearly have some time for Interpol, but I wont sully them with the name of the Editors, as theyre better than those turgid self believers. Well on their way.' Gill Mills - Best of MySpace Podcast. 'The missing link between Joy Division and New Order' Kerrang Radio. Tickets now onsale for Aberdeen, Glasgow and Edinburgh. Isolated Atoms are a band well worth checking out, as are The Marionettes and Curators!! how you get involved with them? Local supports to be announced? That mean its a 5 band bill or am i totally reading this wrong? Yoinked. Don't mind if I do. So, you'll be at the Glasgow gig then, right...? need any posters done guys? Velvet Audio will not be playing the Aberdeen leg of the tour. Added as local support for 1st April. Still one local support to be confirmed. (any bands fancying a slot drop me a PM). best news i've heard in a while!! !